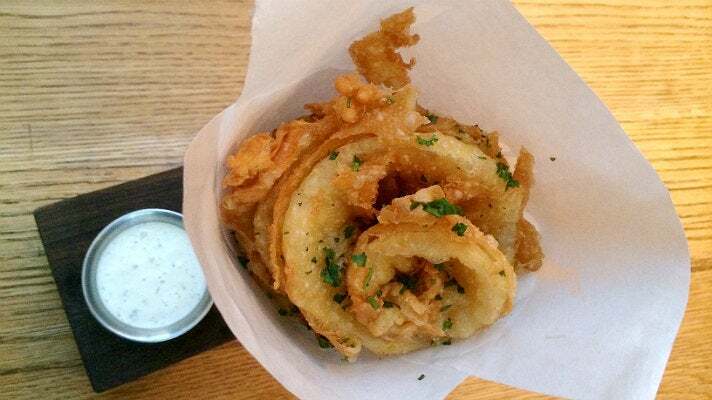 Whether they’re thick or thin, breaded or tempura battered, onion rings remain a classic side dish that is particularly popular at steakhouses and gastropubs. 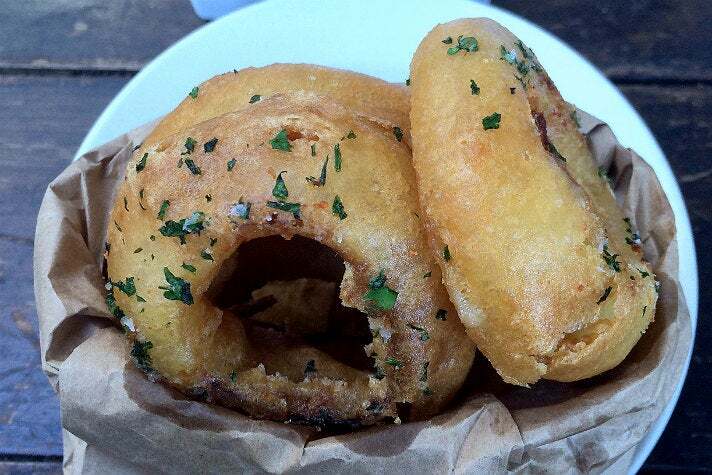 Learn about 10 of the best onion rings in Los Angeles, listed in alphabetical order. 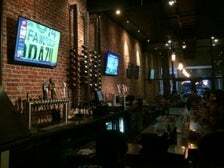 This Uptown Whittier gastropub from chef-owner Tony Alcazar and a pair of firefighters has become popular thanks to their rotating craft beer selection and thoughtful comfort food. 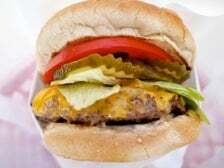 People can’t live on burgers alone, so by all means invest in Ed’s O-Rings. Alcazar honors a regular customer with a stack of crisp-coated wonders that arrive in a cast iron skillet. Alcazar dips the outer layers of jumbo yellow onions in a tangy combo of buttermilk and Greek yogurt before getting dipped in flour. Once an order comes in, they take another dip in Cajun spiced tempura batter that’s spiked with Bear Republic Racer 5 IPA. A dusting of sea salt and accompanying barbecue sauce complete the presentation. Richard Mandeville and wife Susan moved beyond Montrose by opening this sleek West Hollywood gastropub at the base of a mixed use development. The space features a glass front, black awning, zinc bar, communal wood table, welcoming patio, and bulldog paintings, to honor the couple’s beloved fat dog. 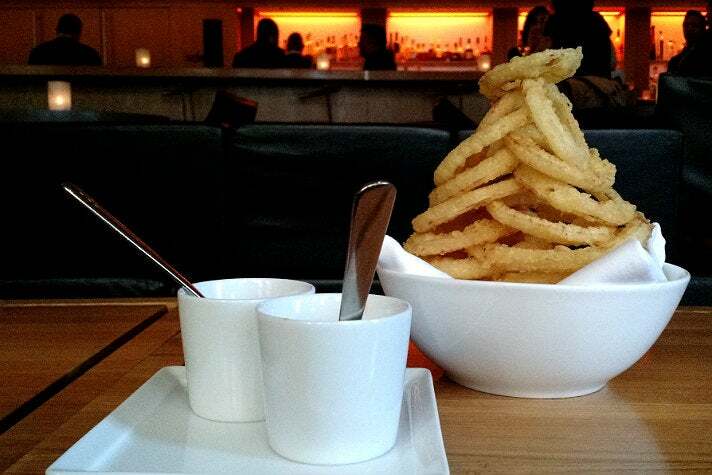 John Gladish prepares chef-driven gastropub fare, including crisp-sheathed onion rings dusted with sea salt and chopped parsley. The plate comes with tangy ketchup and pungent garlic aioli, to satisfy different dipping preferences. This institution dates to 1984 in Beverly Hills' Golden Triangle. The Grill on the Alley remains all class, with white tablecloths, jacketed servers, sumptuous booths and gold chandeliers with bulb lanterns that resemble planets orbiting the sun. Israel "Izzy" Camacho, who started on the opening crew, now oversees the whole kitchen. He maintains consistent quality on steaks and delectable sides. Jumbo Onion Rings start with white onions that are coated in flour and breadcrumbs. They’re deep fried in Canola oil until crispy, but not greasy, and served with pleasantly pungent ranch dressing. Kristen Trattner and Chef Monica May opened The Nickel Diner in 2008, helping to revive Downtown’s dilapidated Old Bank District. The space features hand-painted menus that the owners uncovered during construction, plus red booths and a semi-open kitchen that showcases short order cookery. 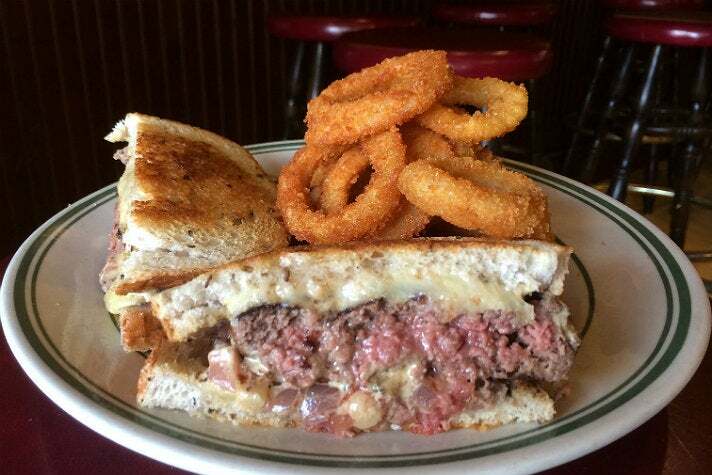 Onion rings normally cost $5, but for only $1, it’s possible to add them to your patty melt, tuna burger or “lowrider.” The golden rings, which are coated in breadcrumbs and fried in Canola until crispy, are even better when dipped in ketchup. Andre Guerrero has built a pair of popular burger, pastrami and pulled pork houses. His first Oinkster is an A-frame structure in Eagle Rock, and its sister location is a sleek Hollywood building with cartoon flourishes, a communal dining room and airy patio. You can snag Belgian fries, an ube shake or craft beer in both locations, but the Oinkster's onion rings can only be found in Hollywood. Guerrero loads red baskets with rings that sport light tempura batter. From there, choose house-made dipping sauces from a condiment bar, including ketchup, chipotle ketchup, garlic aioli and ranch dressing. 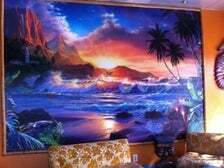 Michael Anapol and Kathie Gibboney’s surf-themed hamburger hut near Santa Monica College includes bright purple, orange and green walls, a surfboard-shaped communal table and a mural of crashing waves. 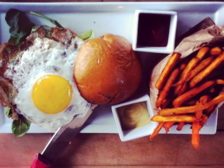 Chef Jimme Morrison engineered the burger menu, focusing on free-range, grass-fed Angus beef. 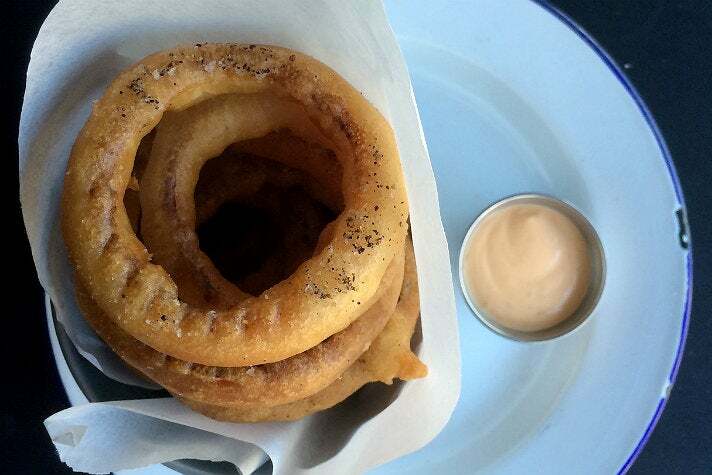 To accompany the burgers, you’ll find terrific Maui onion rings. Wisps of sweet onion are coated in light, parsley-flecked homemade buttermilk batter and come with creamy "BBQ sauce." Located in the Beverly Wilshire Hotel adjacent to his premium steakhouse CUT, Wolfgang Puck's Sidebar provides diners a chance to enjoy his team’s same attention to detail, but with bar food in a more casual setting. The space features a wood bar and walls and a lounge with low-slung, modular grey and black furniture. 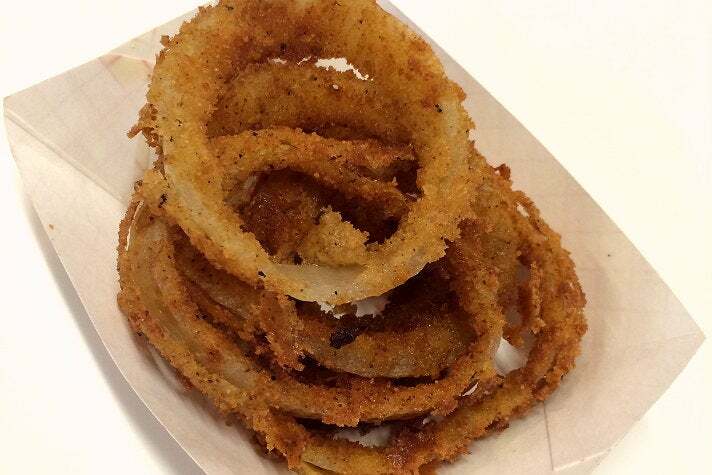 Tempura onion rings are stacked in a pyramid and involve Texas sweet onions coated in whisper thin batter and fried in peanut oil. The bowl comes with ramekins of Heinz ketchup and aromatic, bright orange paprika saffron aioli, both of which are great for dipping. 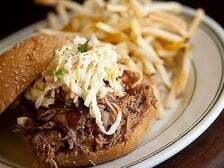 This meaty, boozy place is the latest restaurant from Blackhouse Hospitality Group partners Jed Sanford and chef Tin Vuong, who have already dotted the South Bay with spots like Little Sister and Abigaile. The space features brick walls, tile floors with star patterns, wood rafters with skylights, and a tiny marble bar backed by whisky shelves. 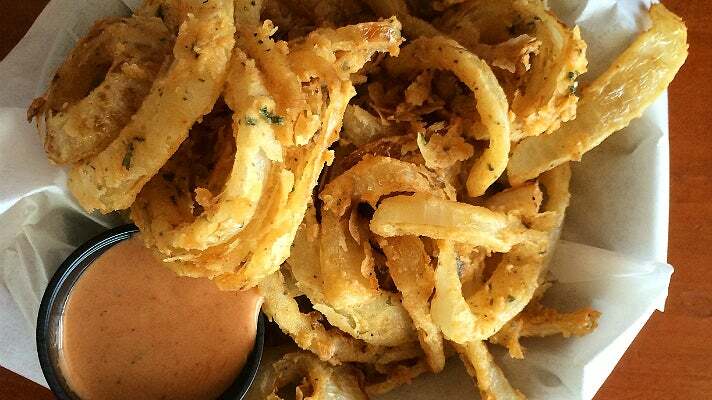 Complement your T-bone or Kansas City strip with crispy onion rings. 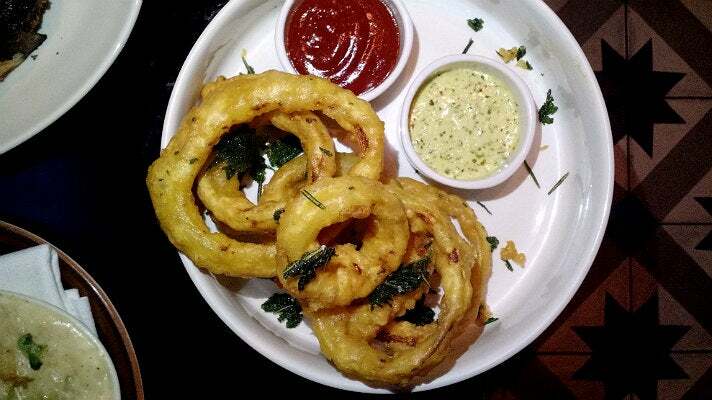 The rings are tempura battered, deep-fried with rosemary and sage, and served with green goddess dressing and house curry ketchup, both of which add pop. This Atwater Village classic from Lawry's dates to 1922 and features a diverse environment that includes more than 100 tartans representing different Scottish clans, colorful flags, elaborate chandeliers and a wall of Scotch that greets guests. Executive chef Mark Kalenderian presides over a hearty menu highlighted by Lawry’s signature Prime rib, herb-smoked lamb sirloin and haggis pot pie, all of which benefit from a side of onion rings. 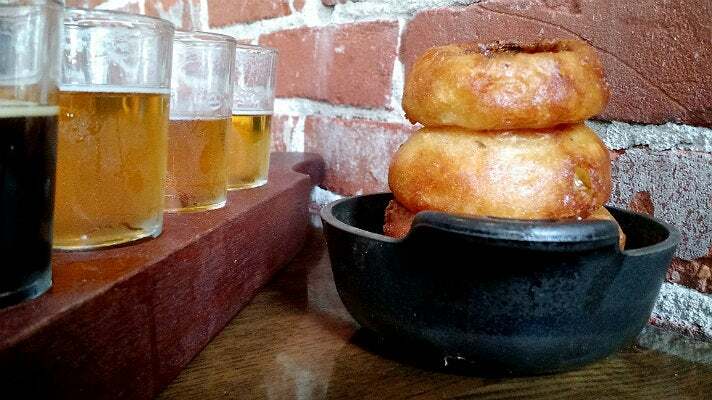 These rings tout crispy PBR batter and come with house-made ranch dressing, a tangy blend of sour cream, herbs, onion and garlic. Brooke Williamson and Nick Roberts debuted their Playa del Rey gastropub in 2011 and it continues to be a beachside favorite. The space features a glass front, black steel tables, wood bar and rafters and blackboard menu. A sign above the bar encourages social “lubrication,” and plenty of craft beers are available to deliver on the message. 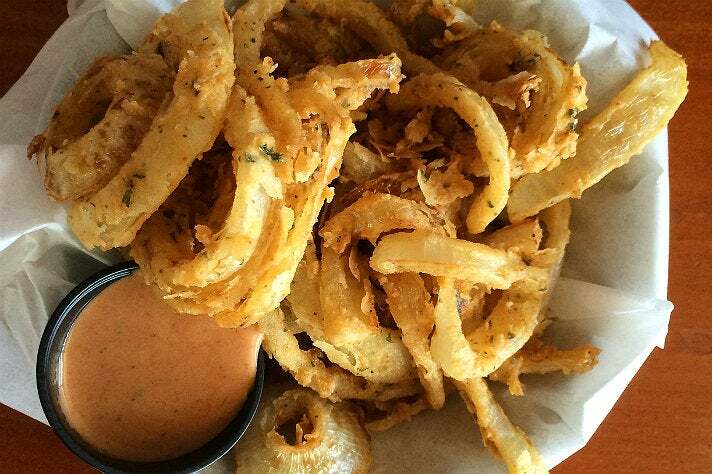 Balsamic onion rings feature red onions tossed in tangy balsamic vinegar. 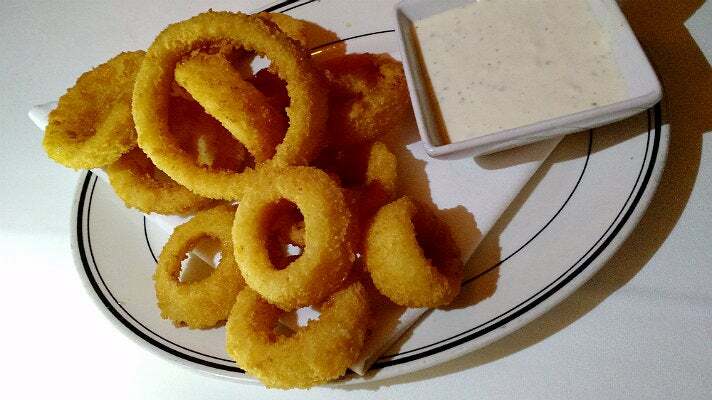 The rings are tempura battered, deep fried to crunchy, well seasoned with salt and pepper, and served in a paper-lined pail with subtly spicy chile aioli.